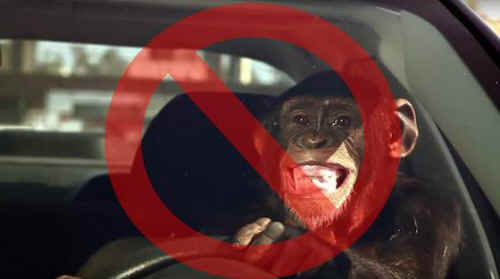 Over a decade ago, Suburban Auto Group started airing commercials that exploited chimp "actors" for a cheap laugh. Eyes on Apes has repeatedly reached out to the Auto Group's Ford general manager since 2003, including just this week—yet the ads are still airing. The chimpanzees used in these has-been, re-run commercials were leased by notorious trainer Sid Yost, who was documented punching, kicking, and striking chimpanzees with a mallet. This type of treatment is routine for chimpanzees who are still used in entertainment. Suburban Auto Group uses graphic designs of chimpanzees with wide toothy grins, which looks like a human smile, but is actually called a "fear grimace." It is appalling that Suburban Auto Group continues to use this graphic after Eyes on Apes has repeatedly explained how it sends a harmful message. Chimpanzees are an endangered species, deserving of our respect and protection—not to be used as a cheap gimmick to sell cars. The rest of the world is beginning to recognize these issues, but this car dealership seems set on refusing to care or evolve. Help us get Suburban Auto Group to understand that continuing to use these commercials hinders conversation efforts and perpetuates the abusive and dangerous entertainment and pet industry, and please send a polite and brief letter to the company's general manager. Your letters do work! A McDonald's France commercial with a chimpanzee actor was pulled after they received feedback from Eyes on Apes supporters like you and other advocacy groups. Great victory! We hope to see Suburban Auto Group make the same progressive decision.